UltraCruz Equine Pure Natural Vitamin E Plus provides natural antioxidant and immune support for Horses. Vitamin E has been implicated as a cofactor in glucose production and supports healthy concentrations of other important elements such as iron, calcium and potassium. It works closely with selenium and vitamin C to support the immune system and protect the body from the oxidative stress of Exercise. This high quality vitamin E supplement is provided as a palatable Pellet. Vitamin E is a fat-soluble vitamin that functions as an antioxidant. It is often used to help performance Horses that experience soreness and tying-up as well as Horses that require antioxidant support. Vitamin E helps eliminate free radicals and prevent oxidative damage to tissues and it is also important for the proper function of nerves and muscles. Vitamin E generally is supplied through green forage, though levels begin to diminish once pasture is cut for hay, and little is added to most concentrate feeds. Storage can further destroy some of the vitamin E content of feed. 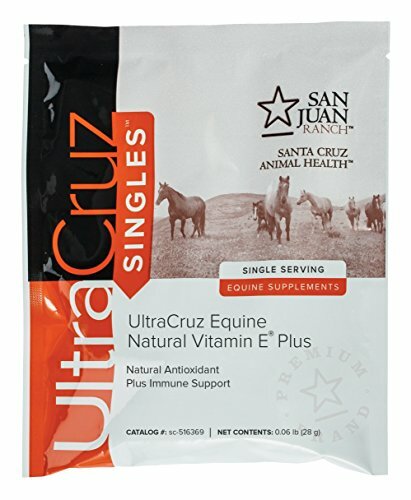 Adding a high quality vitamin E supplement such as UltraCruz equine natural vitamin E to your horse's diet will help support your Horse against the damages of oxidative stress which can be caused by free radicals. If you have any questions about this product by UltraCruz, contact us by completing and submitting the form below. If you are looking for a specif part number, please include it with your message.